(Newser) – While campaigning for Donald Trump on Wednesday, Rudy Giuliani let loose on something he thought he heard Hillary Clinton say during the last presidential debate. "Don't tell me, if you said that, that you remember Sept. 11, 2001," he said. "I remember Sept. 11, 2001. Yes, yes, you helped to get benefits for the people that were injured that day. But I heard her say one day she was there that day. I was there that day. I don't remember seeing Hillary Clinton there." 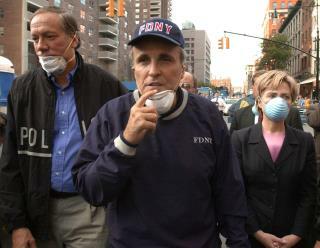 As the AP reports, Clinton, a New York senator at the time, was in Washington on Sept. 11, 2001, because Congress was in session, but she flew back to New York on Sept. 12, 2001, and was pictured with Giuliani in a widely-circulated photo. The issue, however, is that Clinton never actually said she was in New York on 9/11. Giuliani has now apologized for the gaffe. It's a little late in the day to be coming to your senses Rudy. I guess you got a strong whiff of failure and realized you might NOT get appointed to a Trump cabinet.